Whew, you have come a long way baby! This is a picture of me in February 1996 holding my daughter and another of me in November of 2001. 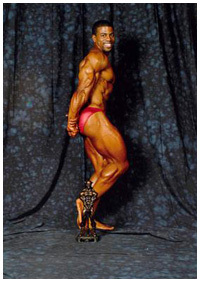 I began weight training in June of 1998 for recreation and basically occupy my time in between work.. Two years later, I entered my first bodybuilding competition at the NPC Bodyrock held in Virginia. I took the novice lightweight class and after that I was hooked! I then set my sights on obtaining my pro card in a drug free organization that conducted polygraph along with urinalysis testing. Therefore, in 2002, my only focus was to get turn pro which I was very happy to have accomplished!